We are still a bit blown away by the development of this relationship with Japanese academics and youth workers, prompted by their enthusiasm about our Story-Telling model. And as you will see from Bernard’s notes the ensuing conversations have led us to reflect critically on our efforts thus far. Whisper it quietly, but interest has also been shown in Kazakhstan! These notes have been prompted by a youth work story-telling workshop and follow-up discussion which IDYW was invited to arrange for a visiting group of Japanese youth work practitioners and researchers. Because unfortunately other IDYW colleagues were unavailable on the dates, I ended up facilitating on my own what turned out to be a searching and thought-provoking event with participants deeply committed to the kinds of youth work which IDYW is trying to defend. After engaging actively throughout in – with breaks and time for translation – a five hour workshop, the group met again in the evening for its own ‘debriefing’ session. This generated two pages of typed-up questions which were emailed to me overnight as prompts for a further two hour discussion the following morning. Though language and cultural differences inevitably sometimes presented barriers to be overcome, these also helped to prompt exchanges which seemed to me less likely to occur in an all-UK group, forcing me to struggle for explanations and clarifications which I’ve not been asked for before. These not only seemed important in their own right for these participants. They also raised issues and questions which I believe deserve further collective consideration within IDYW. Hence these notes – which have been shared first with, and some comments added by, the workshop participants. The workshop came out of personal contacts which a number of us who are active in IDYW have had over the years with Professor Maki Hiratsuka of the Faculty of Social Sciences at Hosei University and who on a previous visit set up a meeting with me specifically to discuss the IDYW story-telling process. As for personal reasons she wasn’t able to come this time – though she did participate by Skype in most of the sessions – the group was led by the colleague who had also been involved in that earlier discussion, Professor Akio Inui of Tokyo Metropolitan University. Members of the group included four other academics, two of whom are doing part-time youth work, six full-time youth workers and youth work managers and a full-time student on an MA course at DMU who attended the workshop I facilitated there in April. 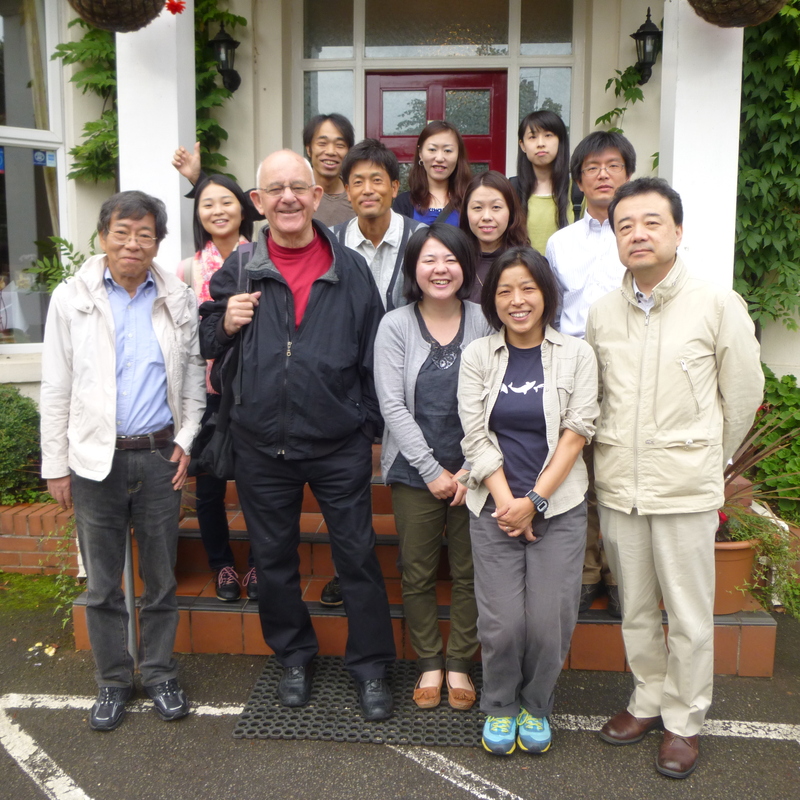 Both in informal conversations and during the working sessions, it became clear that, despite the obvious historical and cultural differences, some clear parallels existed between youth workers’ perspectives and challenges in Japan and in the UK. This came out particularly as participants explained the difficult balances they were having to strike between funders’ demands for work that was targeted on special groups of young people and the workers’ preference for and commitment to open access facilities. These included not only youth centres and drop-ins but also homework clubs which young people chose to attend for social reasons as well as to do their homework. In one informal conversation, too, the wider neo-liberal context for these struggles was also explicitly acknowledged. The build up to the workshop was in itself an alert to the level of interest and commitment participants were bringing to it. In an email a few days before the group arrived Maki explained that she had translated the IDYW template workshop programme and facilitator’s prompt sheet which all participants had then been asked to read. Colleagues had also translated and shared with group members the IDYW Open Letter and the story-telling workshop flyer while some had also read some of the ‘This is youth work’ stories for a pre-meeting they had had. They apparently had been particularly impressed with ‘On the boundary’ and had run workshops to try and ‘unpick’ it. Over the two days it also emerged that a number of the group were aware of – even familiar with – the IDYW net Resource on story-telling. One feature of this workshop was however, at least for me, unusual: the group members’ hope and indeed expectation that they would not only go through the story-telling process itself but would also come away clearer about how this worked and how they might themselves facilitate workshops. How had we negotiated that stage of the process? What were its pros and cons? Might there be a better way of doing this? Not unrelated to these discussion, it seemed, was a question which emerged from the group’s evening debriefing session on how IDYW trained its facilitators. This is a gap which IDYW identified some time ago but which, as I see it, we have so far filled only by facilitators ‘learning on the job’. A research group has met with the workshop participants in Tokyo to consider how they can use story-telling ‘to develop Japanese youth work’. The worker had described how she had had to tell one of the young men that she needed to end one of their conversations because she had arranged to meet her husband. His reaction led her to conclude that the young man held the view that women should stop working when they married, prompting a discussion with him on marriage, divorce and the role of women. In this she talked about her own family experience as a way of relating to him ‘as a human being’ – an approach which revealed some differences amongst group members on whether they should practise first as ‘a human being’ or as a youth worker. Where in youth work the personal-professional boundary is, and should be, drawn. What any this might mean and indeed possibly communicate about a more equal power balance between the youth worker and the young people. The chosen story was the only one of the four offered which focused on working with a group. As she told the story, the worker in fact made it clear that she had hoped that the four boys could develop stronger friendship links which would allow them to talk with each other about the serious private problems they all had and so be helped by sharing them. This however proved difficult for them to do. However the worker did see it as important that one of the young man had chosen to talk with her about his mother’s illness as it suggested that their, till then, loose relationship might be getting stronger. This led to exchanges during the ‘unpicking’ process on how important work with an individual had emerged because of how, over time, the worker had worked within and through the group with this young man. In the last 5-10 minutes of the workshop I asked the group to check the story against the IDYW ‘cornerstones’ to identify if and how it was for them an example of youth work – an intervention which, one of their follow-up questions indicated, was a focus of their evening ‘debriefing’ discussion. Would the group have gained more if the story had covered a longer time-period than the two days described? My view was that, even where a story does extend over a long time period, in order to draw out its specifically youth work ‘content’, it’s usually necessary to focus in detail on quite small time frames rather than the broad picture. What are the best questions for ‘unpicking’ a story? Rather than addressing myself just to the story-teller, should I perhaps have asked a more open-ended question to the whole group on what the worker might have taken for granted in her practice? Would this have allowed participants to take greater ownership of the idea as well as to come up with different answers from mine? As the workshop was itself a form of group work, wouldn’t working ‘in and through the group’ like that have in fact been a better way to proceed? What are the main purposes for a story-telling workshop? This was prompted by a more specific question I had not met before and which came up during the workshop itself as well as out of the group’s evening debriefing session: what is the difference between a case conference and story-telling? My response was that the answer lies entirely in purpose. I thus suggested that a case conference was intended to produce an action plan aimed at helping an individual or family; while, though the story-telling may prompt a story-teller to act differently in the future, its main rationale is – at least as IDYW has been using it – to help participants become clearer, more confident, more articulate about their youth work practice and what makes this distinctive and so important to defend. What however also emerged from this discussion was some critical reflection on how far story-telling could (even should) be focused on helping to demonstrate youth work’s ‘impact’. Though this is for example what IDYW is being asked to do in Ireland in October, I suggested that within IDYW there is some ambivalence about it and even differing opinions. The ‘cornerstones’ – how set in stone are they/should they be; or should they change and develop in response to different circumstances, cultures etc? The answer I offered was two-fold – and contradictory. On the one hand, given that youth work is a human construct and a complex form of human activity, of course the ‘cornerstones’ could never be assumed to be fixed and final – ‘finished’, uncontested, beyond debate. Indeed it was important to acknowledge that they contain their own internal contradictions. This for example was true for one of the ‘cornerstones’ we had given a lot of attention to in the workshop – working with and through young people’s peer group relationships which can of course for some young people sometimes be far from supportive. However, in our present political situation in the UK powerful policy-makers and funders, when they’re not actually trying to eradicate the kind of practice we were discussing, are defining it in ways that serve their interests and priorities rather than young people’s. Within those realities I admitted to acting myself on the premise that the bottom lines which the ‘cornerstones’ seek to spell out often demand uncompromising advocacy and defence. How far does and should the confidentiality rule limit what is raised in a story and the subsequent discussion of it? Here group members made an interesting and important distinction which I hadn’t considered before. They talked on the one hand about telling a story to a group of close working colleagues like themselves where trust already exists and greater openness seems possible. On the other hand, they suggested that sharing a story with participants whom the story-teller has not worked with previously and who s/he may not even know must put more constraints on what they can and should share. For my part, I suggested that perhaps the reality might be even more complicated. I illustrated this from a workshop I facilitated for a youth work team made up of the manager, full- and part-time workers, volunteers and a student. Here all the participants were likely to know and even know something about the individuals described in the story. However, the story-teller would still be constrained by the fact that all members of the team wouldn’t necessarily know all s/he knew about the young people described, and the young people wouldn’t necessarily want them to know all that s/he knew about them.